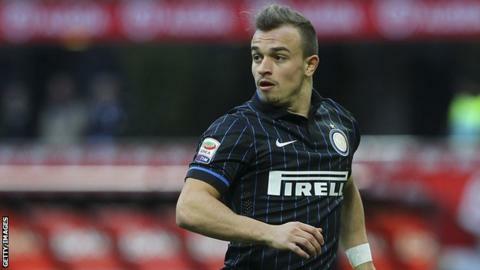 Inter Milan winger Xherdan Shaqiri could still move to Stoke a month after the deal was called off, according to manager Mark Hughes. Stoke had agreed a club record fee of £12m for the Swiss international but they withdrew the offer in July after he failed to respond to their deadline. The 23-year-old was pictured at the Britannia Stadium on Sunday during Stoke's 1-0 defeat by Liverpool. "If we can conclude something then we'll be delighted," said Hughes. "But nothing is certain in the transfer market when the window is open. "We've been close in the past and haven't been able to conclude deals so we'll have to wait and see."